Embarque em um trem a vapor histórico para um passeio de 1 hora pelas montanhas de Santa Cruz, saindo do Acampamento de Felton, e mergulhe fundo em bosques de pau-brasil e no passado da Califórnia. Chug up as faixas estreitas sob as árvores que sobem mais de 270 pés (82 metros) acima do chão da floresta. Aprenda a história da floresta, a estrada de ferro e o acampamento de registro que serviu. Passeie pelas imensas árvores do Parque Estadual Henry Cowell Redwoods, visite uma antiga loja geral e um escritório do xerife e aprecie a serenidade das antigas florestas da Califórnia. Faça o seu caminho para o ponto de partida do trem a vapor histórico no Roaring Camp em Felton, Califórnia. Acomode-se em seu assento no carro ao ar livre e inspire o ar limpo da floresta enquanto você entra na floresta de sequoias. O gigantesco trem histórico remonta ao final do século XIX e é um dos motores a vapor de bitola estreita mais bem preservados do país. Esses trens já foram usados ​​para transportar madeira das florestas de sequoias agora protegidas. Cruze sobre os cavaletes e sob a cobertura do dossel da floresta exuberante no caminho até o cume da Bear Mountain. Ouça o comentário esclarecedor do maestro sobre a história da ferrovia e o ecossistema diversificado da área. Hop no topo da Bear Mountain para patrocinar o armazém geral. Passeie pelo vizinho Parque Estadual Henry Cowell Redwoods para esticar as pernas e tirar fotos bonitas da paisagem natural. O passeio completo de ida e volta leva cerca de 1 hora. My son and grandson really liked it. They had a great time. 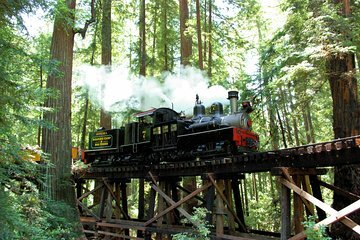 I always love trains so for me train redwoods, history was a great family time outing. This was our first trip on the Roaring Camp Steam Train. What a great time we had! The tour guide was very knowledgeable about the area and the trees. We learned a lot about the habitat. Next time we have friends visit we will take them on the ride. Pleasant experience. Staff was very friendly and knowledgeable. Facility is very clean. Great selection of food and beverage. This was a well planned and informative experience. The train was great as well as the beauty of the Redwoods. It’s educational for the kids and lots of fun for them. As for adults, it could have been better. Make sure to bring bug repellant because I have gotten bitten. Some people are rude due to the fact that as you get off the train at the stop in the mountain, some left their belongings on their seat to save seats. As you climb back to your spot, be aware because some people WILL take your seats if you didn’t save your space. There wasn’t too much info for the guy to talk about as he did already on our way up. Snoozed a few times traveling back. It’s the same route. Once is enough for me. We had the best time on this little train. This slice of heaven is worth the small little trip and the small little price. The redwoods are simply amazing and it was so easy to get to and the little town had food and souvenirs. It was a great way to spend our morning before we took off to San Fransisco for a concert. I went with my boyfriend and we had a blast! I imagine coming here with kids would be even better, since there are lots of activities. Fun trip up the hill and through the woods and back down again. The train was fun and it was wonderful seeing all the redwood trees, the guide was great . It was very enjoyable . A great attraction. Fun for all from 8 through 80.